To collect, organize, and share interesting items you’ve found on OfferUp, save them into Boards. Any item can be saved to a Board directly from its listing. 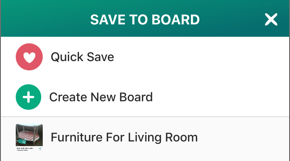 Quick Save: Save the item to your private Quick Save Board. Create New Board: If you want to organize items into custom collections, choose Create New Board, enter a name, and tap Save. These Boards can also be shared with friends. If you already have a Board you’d like to use, tap its name. To see your Boards, tap Offers and then Boards.